I am a French national residing in the U.K. with my non-EU husband. He is here on an EEA Family Permit, and will apply for the residency card when it expires (but U.K. website even says the residency card isn't technically required--odd!). We want to travel to France for 3 days. Does he need a visa? 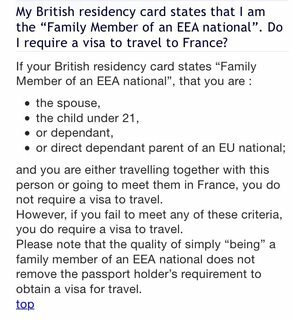 The issues underlying my question are two-fold: 1) it's a permit, not the Article 10 residence card (but holds the same weight) and 2) because I'm French and we'd be going to France, is there visa exemption when traveling to my home country? I emailed the French embassy but I think they are misinformed as they said family members of French citizens aren't covered under Directive 2004/38, which conflicts with a recent court case cited in another thread. At this point there's no time to apply for a visa in time for our trip, so I almost want to wing it! The EEA family permit doesn't say I am French, it just says : "EEA family member to join MY NAME" I've read anecdotal accounts online with similar situations who said their spouse was not required to have a visa. It almost sounds like it depends on border control. UPDATE: After extensive online research and some anecdotal accounts of border control allowing holders of EEA Family Permits to enter France visa-free, we decided to try our luck. My husband was allowed to travel by plane with his EEA FP from the UK to France, and had no issue with border control at either end. We did not get the sense authorities were very informed/concerned - they just glanced at the EEA FP and stamped his passport. I don't know if this is standard practice or we were just lucky, but thought it was worth informing anyone in a similar situation. No, your spouse can only travel visa free with an Article 10 residence card. The EEA family permit is similar to an Article 10 card, but for the purpose of visa-free travel, only the Article 10 residence card will do. You may be able to apply for the visa at the border, though, if you are not flying to France, but you might have trouble. The process of getting a visa for the spouse of a French citizen is more difficult, not less, than for spouses of citizens of other EU countries. Your husband should be able to benefit from the simpler EU procedure described in directive 2004/38/EC, because you reside in another EU country. This follows from the Surinder Singh judgment, but I don't see any evidence that the French government has implemented this judgment, so I would not count on it if I were you. There's lots of confusion because people just don't understand what they are talking about. If you ask about travel to some Schengen countries visa free you will receive different answers about different requirements because it is not a visa free travel. EEA family permit actually is a visa. It is not a Schengen visa because not all EEA countries are in Schengen zone. It is a visa for all EEA countries if you travel with your family member or you travel alone to join your family member who already is in that country. Bear in mind that EEA family permit is not processed by the UK border law, but European laws and officers. You even have this information when you fill the application for it. For example there's information that if you are unmarried partner and you can prove durable relationship EEA family permit is for free. If you can't prove durable relationship your application fall down into UK fiance visa and you have to pay the fee and it will be processed by UK law and clearance officers. So that's what exactly happen in your case. At the France border control you show them EEA visa and they treat it as a visa of multiple entry what is clearly stated on the sticker. Not the answer you're looking for? Browse other questions tagged visas eu spouses french-citizens or ask your own question.